The most important thing about November 8 is of course the result itself, but as a professional social scientist, I want to put out a few thoughts on what the 2016 elections might mean for social science. For the last year, I have repeatedly told colleagues and friends I thought there was no chance Donald Trump would be elected president. Yesterday, I told a colleague I thought Hillary Clinton would win the popular vote by maybe 3 percent and it could be an early evening if she won Florida or North Carolina. Long-term trends: extensive political science research suggesting that economic and political fundamentals, and underlying demographic shifts, are more important than the campaign itself. Much of this research suggested any Democrat running in 2016 would start the race ahead of any Republican. Month-by-month measures of performance: immense amounts of public opinion polling and detailed analysis of it both by academic political scientists and by data journalists, which almost consistently showed Hillary Clinton ahead nationally and in key states. The campaign itself: the sense—impressionistic, but linked to my own qualitative research and the five years I lived in the US—that while Donald Trump clearly spoke to deeply held grievances amongst many (especially White) Americans, a billionaire member of 1% with a history of personal and professional scandals who did not have the support of his party was unlikely to make major gains during the campaign itself, especially as his organization itself seemed disorganized and inefficient. Again, I was wrong. We were wrong. Very publicly, both in terms of academics who have had the courage and sense of citizenship to publish their predictions along the way and in terms of data journalists working in large part on the basis of social science data and methods, only doing so in real time with running commentary. It is a humbling moment. The scientific response is to re-examine our assumptions, methods, and data, and see what we can do better. One result, however important and high-profile, does not disprove everything we thought we knew as scientists about politics and everything we thought we knew about how to study politics scientifically. Science is hard. We are in the dark, poking at the world with different sticks. But we shouldn’t trivialize just how important this is, and I think addressing it will take more than tweaking and paradigm repair. As powerful as I believe quantitative analysis and survey research can be, I can’t help but feel that part of the problem is that many of us as social scientists have lost track of what politics means for many people. For me, the 2016 UK Brexit result and the 2016 US election results both illustrate this wider problem. It is easy to look back and identify prescient observations, but in terms of trying to make sense of November 8, I can’t help but feel the most insightful books might have been Katherine Cramer’s The Politics of Resentment and Arlie Hochschild’s Strangers in Their Own Land. Neither of them aimed to predict the election outcome. Neither of them focused on the kinds of large quantitative data sets, detailed polling, or scraped digital trace data that most social scientists work with. Instead of looking at the numbers, Cramer and Hochschild went and talked to people to find the feelings, emotions, and meanings that are hard to get at with the most widely used social science methods. I want to be clear this is not about qualitative methods being good and quantitative methods being bad. They are good at different things and should compliment each other. We need to capture both stories and numbers to understand the world (and in the social sciences, to understand how people understand the world, and act on their understanding). We as social scientists do not have a good, evidence-based understanding of how most people understand and relate to politics and the world around them. And if we don’t have that qualitative understanding, it is very hard to develop quantitative analysis and methods that will capture it. We know a lot about what people do, but very little about what it means for them. I think it is clear we don’t know how most people feel about politics and how it ties in with other aspects of their lives and identities. Yes, we may know that some of them are not very interested, don’t like it very much, or a quite partisan. But what does that actually mean? I don’t think we know. Historically, I think it is fair to say social scientists have simply assumed we knew, and primarily asked qualitative questions about the lived experience and perspective of groups that were considered minorities. In my view 2016 shows we need to start qualitatively researching the (diverse, fractious, fascinating) majority to, and see whether a better, evidence-based understanding of how people relate to politics and public life can help us get it right next time. Just read the 2002 Perspectives on Politics symposium on the use of elite interviews in political science (but more broadly relevant) for the first time. Tons of useful reflections and questions asked here as part of what was originally a short course in elite interviewing organized by Beth Leech (of Basic interests: The importance of groups in politics and in political science-fame) at the 2001 APSA annual meeting. How do you secure access to you can actually conduct your elite interviews? How do you structure your interview guide when dealing with elites? How do you conduct and code elite interviews? How do you think about validity and reliability in elite interview research? Jeffrey Berry in his contribution makes an observation about the role of elite interviews that arguably apply to political science and political communication research too (indeed Berry has moved into pol com in recent years in his work on The Outrage Industry with Sarah Sobieraj. There is clearly plenty of room here for junior scholars to make their name and make a real contribution to the field both empirically, theoretically, and in terms of methodological reinvigoration and innovation. It is also interesting to note that the field-specific (endogenous) discussion of elite interviews in political science and political communication research seems limited in scale and scope, and is often disconnected from other fields like sociology, management studies, etc that have very long and developed traditions of relying at least in part on elite interviews. Check out the very cool inter-disciplinary and inter-departmental Qualitative Research Seminars organized at Oxford currently. The website also has suggested readings, slides, etc and is a great resource. 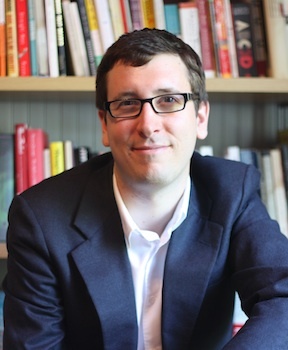 At our May conference on qualitative political communication research, Rod Benson gave a presentation (posted here) challenging what he sees as the rise of a “new descriptivism” in political communication research and journalism studies. Broadly speaking, Rod was taking aim at qualitative studies more interested in how-type questions than why-type questions, sometimes reluctant to discuss issues of generalization, and, especially in journalism studies, increasingly framed in the terminology of actor-network theory (ANT, the tradition represented by Bruno Latour and others more broadly coming from the field of science and technology studies (STS)). The implicit contrast here is in part Rod’s own impressive and influential work (drawing on in large part on Pierre Bourdieu’s field theory), and that of like-minded scholars (institutionalists like Tim Cook, for example)—deeply committed to qualitative methods as a core component of political communication research, but also more explicitly interested in generalizable findings and formally elaborated causal theories than some others. Rod’s talk implicitly presented this tradition as old, and the “new descriptivism” as, well, new. I came to think of this discussion when I read Adam Gopnik’s wonderful profile of the great sociologist Howie Becker in the New Yorker recently, in part because I have often been struck by what I see as the underlying and implicit commonalities between an older tradition of Chicago-school type American sociology—Becker’s supervisor at Chicago was Everett Hughes—and what I consider some of the best examples of contemporary ANT/STS-inspired work. [Becker’s] work is required reading in many French universities, even though it seems to be a model of American pragmatism, preferring narrow-seeming “How?” and “Who, exactly?” questions to the deeper “Why?” and “What?” supposedly favored by French theory. That may be exactly its appeal, though: for the French, Becker seems to combine three highly American elements—jazz, Chicago, and the exotic beauties of empiricism. Gopnik’s article also explicitly highlights how the low-key and straightforward style of analysis and writing—no less demanding than complex modelling and convoluted language, I would add—in fact share many of the same concerns that occupy people who prefer a more abstract and formal theoretical language. It is interesting, however, that the profile of Becker also makes a Bourdieu-type argument about the relational dynamics of many fields that is implicitly in favour of the kind of heterodox mixed approaches Rod also talked about in May. Becker’s role as the American not-Bourdieu is so essential to his reputation in France that, in talking about Becker, one invariably also talks about his other. Also, in the spirit of academic infighting, Becker is, for all his qualities, not really fair to Bourdieu when he says “he doesn’t speak about people. He just speaks about forces. There aren’t any people doing anything.” I don’t buy this. I think there is room for finding much more common ground here by thinking more in terms of difference of emphasis than a deep antagonism. Scholars like Bourdieu are of course not indifferent to agency, to people and their motivations, just as scholars like Becker aren’t indifferent to why-type questions either—it is just that the underlying assumption in much of the Chicago-school tradition is that in many cases, to paraphrase Chuck Tilly, the how is the why, or at least a large part of the why. The focus in the latter tradition is on context and processes more than on variables, as Andrew Abbott has argued, and the mindset more ideographic than nomothetic, but everyone is, or should be, interested in more than his or her case study. What is the relation between the “old descriptivism” (which as I have argued here is not “only” descriptivism, though good description is hard enough—just try it!) and the “new descriptivism” that Rod talked about, then? 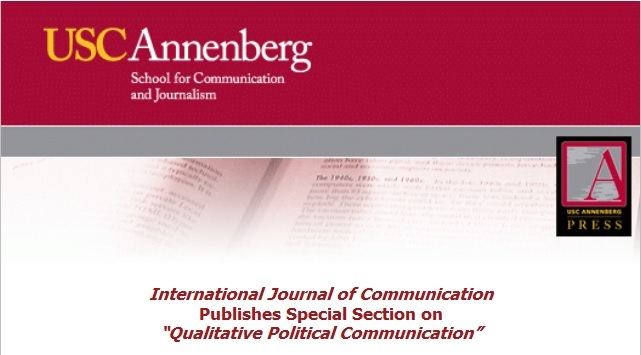 At its best, in my view, ANT and STS-inspired work on political communication and journalism has much in common with the tradition that Becker represents and has contributed so much to, but makes a conceptually very simple but substantially very important move as it asks the “how”-questions meant to lead (also) to at least some kind of “why” answer: it adds technology. ANT and STS-type approaches and related ways of thinking sees tools and large technical systems as integral to almost all human activities, from the most seemingly mundane interpersonal (say, online communications) to the most abstract and global (say, financial markets) and all the ways in which we move between them, the ways they work, the consequences they have. This is something that neither the “old descriptivism” of Becker nor the grand social theory tradition represented by for example Bourdieu has really been interested in. And it is something that, especially with the rise of digital media, but also in retrospect when thinking about the role of newspapers, radio, and television, both political communication research and journalism studies needs to take far more seriously than it has. The question of technology does not supplant questions of meaning or institutions, but it is an important, even necessary, supplement if we want to understand political communication processes, how they work, and what their consequences are. This is where I personally think what Rod calls the “new descriptivism” has the most to add, as I’ve argued elsewhere. Rod Benson have a provocative talk entitled “Challenging the New Descriptivism” at our ICA 2014 preconference on qualitative political communication research, engaging in a constructive–and robustly critical–way with the Actor-Network-Theory (ANT) approach that is increasingly popular especially in some parts of journalism studies. Rod has now returned to his original post and added a response to the many comments, with more to come. Check out the discussion here. “Grassroots for Hire: Public Affairs Consultants in American Democracy” by Edward Walker (Cambridge University Press, 2014) is a really interesting new book that combines interviews, survey data, and secondary sources to analyze the rise of public affairs consultants in the US, the work they do, and the consequences for the political process. In it, Walker examines the “back stage” work that public affairs professionals do to organize the “front stage” of public participation on behalf of various clients in part by incentivizing, coordinating, and orchestrating engagement. It is an important book for drawing scholarly attention to one of the many murky areas of political practice that—like much political consultancy, data service provision, development of infrastructures, and the like—falls between the categories usually used by social scientists to understand politics. Public affairs consultants are not easy to fit into the study of political parties, electoral campaigns, interest groups, or social movements, and thus in danger of being overlooked, despite the substantial size and continued growth of the sector. Everybody talks about the “professionalization” of politics. But few do what Walker does and actually study it. 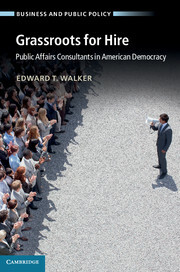 In his analysis of the sector, Walker shows how repertoires of participation originally developed by advocacy organizations, electoral campaigns, and social movements are commercialized by public affairs consultants who offer them as professional services in a marketplace driven by a growing number of especially corporate clients and trade associations investing in public affairs and other forms of lobbying etc from the 1970s onwards. The results is an increasingly “subsidized public” where selective incentivization and rational prospecting by public affairs consultants looking to mobilize support for their clients’ interests work to get people involved in particular political processes. Walker underlines that it is hard for consultants to generate involvement out of nothing and that un-transparent astroturfing and sock puppetry often misfires, so public affairs consultants usually mostly work to selectively and instrumentally channel, encourage, and manage people’s existing motivations. Their work may exacerbate participatory inequalities because they (like most engaged in mobilization) selectively incentivize those already most likely to engage. In September, Daniel Kreiss, Dave Karpf, Matt Powers, and I read and discussed Walker’s book, and below follows an email-Q&A we did with him afterwards about the book. Q: One of your key concepts in the book is the idea of a “subsidized public.” Was there ever a public that was not subsidized in some fashion by parties, interest groups, or others instrumentally mobilizing people to take part the way corporations and trade associations today increasingly do with the help of public affairs consultants? A: I think that it’s important to have the historical awareness to know that there have always been various types of subsidies for public participation, ranging from the early third-party mobilization strategies of professionals in the 30s to incentivized mass-telegraphing in the 1940s, up to the Facebook and Twitter campaigns of firms today. And, of course, it goes without saying that campaigns for the hearts and minds of the mass public predate the public affairs consulting industry itself – indeed, forms of elite-driven mass participation reach back into antiquity. What the development of the “grassroots for hire” industry means is that participatory subsidies have expanded dramatically, in line with a variety of other concurrent efforts to facilitate public engagement through subsidies offered by professionals – these include sponsored deliberative forums and town hall meetings, the founding of advocacy groups and think tanks that serve as third-party supports for industry interests, and numerous other efforts to make it easier to ‘have your say’ in the contemporary context. These broader themes also highlighted in the Democratizing Inequalities volume that I co-edited with Caroline Lee and Michael McQuarrie. The subsidized public idea does share some similarities with the “managed citizen” notion found in Phil Howard’s nice book on new media campaigns. However, I didn’t want to imply that the work of public affairs consultants can be reduced to simple astroturfing and putting words into people’s mouths so that they can, in turn, voice them to policymakers. They do some of that, but the main story is that consultants provide some of the same participatory incentives as other kinds of traditional grassroots associations, only on a larger scale and usually with better data. Q: Amongst other things, you look at the background of people who move into public affairs consulting and show that many of them come from electoral campaign work and move into the PA world essentially to get year-round work with a broader client base. Can you tell us more about the changing boundaries of the PA consulting field? Can we follow the career paths of PA consultants beyond their decision to enter the field? A: That’s right. The field has an interesting history, in which many of their practices came about in the early part of the 20th century through campaigns by Edward Bernays, Ivy Lee, and the first political consulting firm: Whitaker & Baxter’s Campaigns, Inc. Aside from those early precursors, however, things didn’t really get going until the 1970s. So, while the electoral consulting profession continued to grow in the middle part of the century, the practice of paid grassroots mobilization, especially backed by business, didn’t really become appealing until after business groups came under fire by Ralph Nader, the public interest movement, and antinuclear and public health advocacy campaigns in the 1970s. At that point, the cause of public affairs consulting was able to draw in a lot of electoral campaign consultants to work on behalf of corporate America, which was increasingly demanding these kinds of services. In doing so, these new consultants could establish more stable revenue flows protected from the severe fluctuations of electoral campaign cycles. Looking into the career trajectories of public affairs consultants would be an interesting direction for future research. My sense is that now that the field is more established, we are seeing more consulting firms that emerge directly out of advocacy politics and are there to provide services directly to citizen associations, and some of these consultants go back to working for associations afterward. We’re also seeing more conventional lobbying firms die off and get replaced by firms that specialize in grassroots, and so we’re now seeing closer integration of the government affairs and public affairs functions. As the lobbying field shifts toward these kinds of “unlobbyists,” you are likely to see a major alteration in career trajectories. Q: You are a sociologist, and yet, your analysis in many ways seems to be closer to how a political scientist or an economist might have approached the issue, focused on mapping the population and its properties, understanding the market for the services that public affairs consultants offer. Can you tell us a bit more about the decisions you made in terms of how to conceptualize this field? It seems that many sociological theories, including new institutionalism on the diffusion of innovation, field theory on the forms of capital that structure a field like public affairs consultancy, sociology of the professions with a focus on the formation of forms of expertise and boundary work etc could have been useful? A: Above all else, I wanted to offer a systematic picture of the field of these consulting firms and their clients, while helping to inform our understanding of advocacy, organizational/organizing processes, and shifting repertoires of participation. You are right, of course, that those topics put one in a position to build from diverse literatures, including my home discipline of sociology as well as political science, policy studies, and management/organization theory. The perspective I develop in the book is synthetic and seeks to learn from insights in these diverse literatures, although my background is as a sociologist who studies organizations and social movements – that distinct perspective is undoubtedly reflected throughout the book. The resource mobilization theory in the sociology of social movements was, in many respects, the starting point for my thinking on the topic. In their classic 1977 piece, McCarthy and Zald pointed out that as advocacy groups professionalize, you often find that groups have an imbalance in which conscience constituents – those who give resources to a cause although they wouldn’t personally benefit from its goals succeeding – play a dominant role. This is the case with many professionally driven advocacy groups that have a strong role for outside funders and less of a place for grassroots activists; such groups are increasingly important, and yet they don’t fit with our idealized image of civic associations. Ideas like this made me start thinking more seriously about how professionals influence advocacy, and the legitimacy issues they face relative to traditional grassroots associations. So it seemed logical for me to look for ways that this is happening today in the political field. This is also a topic that I’ve written about elsewhere, in research with Frank Baumgartner and John McCarthy. The book was also certainly influenced by institutionalist ideas, especially those related to strategic action in institutional fields, organizational repertoires, and elites. Let me say a bit about each of these. Part of the book’s aim is to challenge instititionalist expectations of organizational isomorphism and conformity to environmental pressures. I highlight this especially in Chapters 5 and 8. I would argue that there has been an important but largely implicit assumption in most analyses of social movements and fields that expects that when organizations are challenged by activist groups, regulators, or other stakeholders, targeted organizations will either make concessions to these demands or, if they can get away with it, ignore them. Along with this, I think most research assumes that strategic action takes place mainly on the part of the activist groups, leaving us with a somewhat impoverished understanding of the strategic options that are on the table for targeted organizations. A contribution of the book, I would argue, is to challenge this implicit assumption and expand the range of corporate behaviors we should investigate. It isn’t just grassroots lobbying campaigns that fit this model, it’s also actions like funding closely aligned third-party groups, filing corporate SLAPP suits against activists, filing amicus briefs, firms joining in as supporters of boycotts of other firms, and more. There’s a whole range of strategic actions that firms take that aren’t on most scholars’ cognitive maps. As I’ve argued elsewhere, these kinds of organizational behaviors are consequential for how we understand firms politically and also for how we conceptualize strategy. I should also note that repertoires are an important concept in the book, and in my view Grassroots for Hire makes us think about how repertoires can cross institutional boundaries and sectors. As I argue at the end of Chapter 2, the development of grassroots lobbying as a commercial activity makes for an important case in which the strategies of civil society groups have been adopted by market-based actors, which is a diffusion process that was made possible by the changing advocacy context starting in the 1970s and 1980s and facilitated by new communications technologies. Finally, on elites, the book is among a variety of other studies in political sociology and organization theory that are returning to some of classic questions regarding how elites hold disproportionate influence in a variety of societal institutions and shape those fields’ direction. Many of these questions were central in mid-century research, but these concerns faded out of view as analysts became more interested in environmental influences on organizational practices, especially through the conduit of inter-organizational networks. But the book is part of a growing literature that returns the focus, in part, to the role of political elites not only in more subtle forms of “robust action” but more directly in organizing mass participation. This helps to round out one of the blind spots of the vibrant recent literature on social movements and organizations. Q: In writing up the book, you have used pseudonyms for almost all the consultants and companies you interviewed for your research. There are pros and cons to this in terms of access versus transparency, in terms of being able to do a piece of research in the first place and the ability of others to replicate it or follow up on it later on, and different academic fields have different conventions when it comes to the use of pseudonyms etc. Can you tell us a bit more about what kind of reasoning went into the decision to use pseudonyms here? A: This is always a difficult decision in this kind of study. In my case, the topic of grassroots lobbying and public affairs work is one that can be sensitive, especially since some of the consultants in the study do engage in contentious “astroturfing” strategies like ghostwriting blogs, creating third-party front groups for business causes, or, more routinely, coaching citizens on the message that their client would like expressed to policymakers. I wanted organizations to be as open with me as possible about their practices and not have to worry that their particular firm was going to be identified because they took part in the research. And I am certain that granting anonymity and omitting identifying details about these firms made them much more willing to have an open and frank conversation with me, and the book benefitted greatly from that decision, in my view. Of course, for those groups that did not take part in the research, the book builds from public records and news reports to talk about those groups by name, and I think that this hybrid approach helps to give readers a sense about the particular groups we are talking about. The cases at the beginning of chapter 6 do that, for example, for specific consultants that work with advocacy groups. Lastly, those who are interested in replicating the research aren’t limited by the book’s approach, given the detailed step-by-step account of the research process found in Grassroots for Hire’s eight appendices. Q: What do you tell graduate students who come to you and ask for advice on how to build on your work. Where is the study of the role of players like public affairs consultants going next, in your view? Should we hope to see comparative work, or perhaps work on how the clients perceive consultants and navigate the market? Should we hope to see work on how the people mobilized feel about the process? A: I think that the book does open up a new agenda, not just on public affairs consultants and their effects, but also on a variety of topics including public trust in advocacy groups (and its consequences), the other types of strategic corporate political action described above, and also broader questions about the consequences of professionally-facilitated advocacy. I think that doing some more comparative work in this area is also essential, and indeed I’ve made some first steps in a comparative analysis of consulting fields in a recent study. In particular, it seems important that future research do more to understand how campaigns that engage in the most egregious “astroturf” (i.e. simulated grassroots) strategies affect public trust in both business and in advocacy groups in general. Tactics like creating front groups, paying activists to attend protest events, and selectively disclosing only those ‘sponsors’ who appear not to have a material interest in the cause – all of these can be seen as efforts to deceive the public in order to benefit a paying client. There are strong reasons to expect that when these campaigns are revealed, public trust in all advocacy groups overall is harmed. I’ve been examining this in new research using survey experiments, and the initial results suggest a powerful negative effect, although these effects are somewhat conditional upon the field reputation of the revealed corporate sponsor. I think we also need to know more about how these campaigns affect corporate bottom lines, similar to how others have studied the effects of protests on stock prices. It seems reasonable to expect that having a third-party “Baptist and bootlegger” coalition emerge in support of your firm would have a positive signaling effect to investors (especially as a firm attempts to manage external challenges such as protests or new regulations), but we need to investigate this expectation with systematic evidence. Others are also carrying forward ideas related to the book, such as in new work on corporate-sponsored boycotts, strategic responses to protest by corporations, issue advocacy advertising, blurring of sectoral boundaries, authenticity in public participation, and a variety of recentstudies on astroturfing. Hopefully the book will continue to reach additional audiences. Cover image from Cambridge University Press, photo from UCLA. Jesper Strömbäck served as the programme planner for the ICA Political Communication Division in both 2013 (London) and 2014 (Seattle), coordinating review of over 300 submission each year. He has written an interesting overview over his impression of the material submitted those two years for the Political Communication Report (the division newsletter, shared with our APSA cousins). As he notes, dealing with all these hundreds of submissions “offers a unique opportunity to get an overview of contemporary political communication scholarship”. Strömbäck’s overview notes the rise of comparative research, an increased interest in notions of selective exposure in media use, and of course a boom in research on various forms of digital media. He highlights advances in the field’s understanding of micro-level effects, especially questions concerning the correlations between particular kinds of media use by individuals and things like political participation and political knowledge, long core concerns for the field. He also notes how framing research, which has for years been a central current in the field, seems to be waning, and is increasingly concerned with frame effects, and less and less with frame building (and, relatedly, agenda building). Similarly, he sees less content analysis than in the past. Here is what Strömbäck writes about methods. Here is what he writes about the dominance of methodological individualism, the focus on the citizenry, and on behaviroral effects research in the field. Strömbäck’s analysis is broadly in line with my own sense of where political communication research is at today. One can see some of this as a weakness in the field, in terms of the breadth of the theoretical and methodological tools it brings to bear, in terms of the limitations of what it can tell us about political communication and its role in the world. I would phrase it differently and say it is also an opportunity for new research pursuing new questions that can complement what we already know (along the lines of what I argued in a 2012 talk later published here). Hence–onwards!